Why buy SeaMaster Lights when there are zillions of lower priced alternatives on the market? SeaMaster Lights are built to last even in the toughest conditions. Mount them anywhere to add lighting for work spaces, safety and night vision preservation, or enhancing deck areas. Simple mounting and wiring make connecting to power sources super easy. 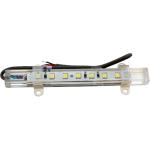 You can now replace those old fluorescent lights with LED cartridges and see what you've been missing. SeaMaster low profile housings come in powder coated black and white finishes or classic chrome to add a designer look to any T-Top or other area. Profile LED Lights and a variety of LED Strip Lights. Each product is handcrafted to our specifications, inspected by our technicians and packaged here in the U.S.. Designed and manufactured to last, every product comes backed with a lifetime warranty.